Barcelona has rail links with various places in Europe and all of Spain. 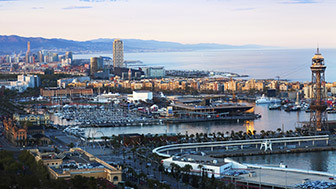 The AVE high-speed network also connects Barcelona with the French cities of Paris, Lyon, Toulouse and Marseilles, as well as Madrid and the south of Spain. And the suburban train networks link the Catalan capital with the main Catalan towns and cities. This is the main station and departure point for high-speed trains as well as international services. The trenhotel night train also leaves from here, as do regional services and trains to Barcelona-El Prat Airport. The station building, an icon of iron architecture, was built in 1929. It is the second busiest after Barcelona Sants. Most of the Catalan regional lines start here, along with some long-distance services. At the heart of the Modernista Route, this is the departure point for regional trains on the Girona-Figueres-Portbou line, as well as those heading south or to Lleida and Zaragoza. The Barcelona-El Prat Airport service stops there. This is the most central station, the departure point for regional and suburban trains to Manresa-Lleida, the Maresme coastline and Vilafranca del Penedès. The trains on the Vallès line of the Ferrocarrils de la Generalitat also leave from here. 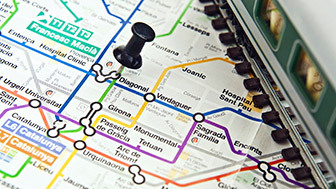 Suburban trains linking Barcelona with other parts of Catalonia also stop at other, smaller stations in the city: Arc de Triomf, Clot-Aragó, Sagrera-Meridiana, Sant Andreu Arenal and Sant Andreu Comtal. The trains on the Llobregat-Anoia line of the Ferrocarrils de la Generalitat leave from Plaça d’Espanya Station.